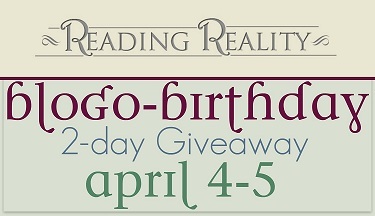 Fifth Annual Blogo-Birthday Blast – Escape Reality, Read Fiction! Congrats on your blogoversary and your birthday! spotlights and reviews on books/authors that I also enjoy 🙂 Congrats on the Blogoversary and here’s hoping you have a wonderful birthday! Thanks for sharing! 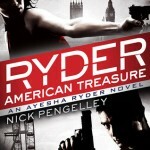 Great reviews and book recommendations keep me coming back to a blog. Happy Blogoversary! I keep coming back to blogs that introduce me to new books, I’ve found most of my favorite books through blog recommendations. And giveaways of course! What keeps me reading is captivating content! Congrats! Happy Blogoversary!!! For me it is the great reviews and the super giveaways. Thanks for this chance. Happy Blogoversary! Wonderful features, great reviews and giveaways are attractive and special. I keep reading this blog for the great reviews of books I was considering reading. I also like seeing how your opinion differs from mine on books we’ve both reviewed! The person running it! I never unfollow but I will always come back if the person is friendly and makes great content or enjoys the same genres and authors! Congrats on your milestone. I found your blog during a hop. I prefer blogs that are user friendly and by that I mean not packed each day with tons of reviews. Don’t like to feel overwhelmed and I do follow multiple blogs. If you have unique post, ones with GIFs, themes, playlists, etc. I love those. Little known books or “underdog” books that are reviewed are good too. Happy birthday in advance and happy blogoversary!! thank youa lot for sharing with us and io do hope you will have a lot of happy and even more good moment in the future as you had in teh past. Congratulations on your blogo-birthday. I love reading about new books. That’s where i find what I want to read. I enjoy reading reviews. I enjoy contests too especially for new authors. What keeps me reading is the reviews! Congrats on your blogversary and thanks for the giveaway!! 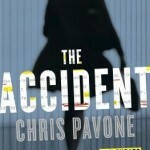 Book reviews that are well thought out and well-written really has me coming back for more. I love to hear people’s thoughts on new books! Happy Blogversary!! What keeps me reading a blog is many things like the reviews; how good they are, how often they’re written, my type of genre etc. , how active the blogger is (if they post one every 2 months I probably would forget about it! 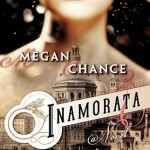 ), how interactive the blogger is with their readers and to hear about all bookish related news! Pingback: Review: The Murder of Mary Russell by Laurie R. King + Giveaway – Escape Reality, Read Fiction! Well-done book reviews and author’s posts are the most important to me. I followed you here from BLI because I really liked your reviews there. 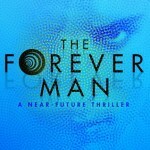 I enjoy the mix of the familiar and the new, with a pretty diverse selection of both fiction and non-fiction. You review a lot of serious, meaty books, but also cover genre fiction like mysteries, romance, SFF, etc. Not only do you review a lot of authors/series I already follow, but you’ve also introduced me to a lot of new authors/series that I might not have otherwise discovered. I appreciate that your reviews are thoughtful, honest, and respectful. You’re clear about what worked for you and what didn’t. Plus, you’re a veritable reading/blogging machine! These are exactly the things I look for in a book blog, and it’s why Reading Reality is one of the few blogs I still follow these days. I hope we’ll continue to celebrate many more blogo-birthdays with you in the future. Happy Blogoversary! I’ll be honest, contests are a big draw for me at blogs, just because my book budget is fairly limited, so if I can win one, that’s great. Bigger than that though, content-wise, I’m really looking for variety in the books featured because that’s how I like to read and your blog is kind of ideal for that with a mix of adult genres. I mean just the fact that you feature adult books makes you stand out since so many others focus on YA (which I love to read, too) but it’s just nice to find a blog that speaks to the adult side of my reading, since those books don’t always receive as much attention. Well I just found your blog thru this hop and the gift cards will keep me coming back. I love to win gift cards. Oh I love reading the book reviews! It really helps me find new books that I might now have found! Happy Birthday and Blogversary! You review a great mix of books and I love reading about them, especially since many are ones I never would have heard of otherwise. I tend to just stick with my go-to genres (romance, UF, and PNR), so I really enjoy having my book boundaries challenged. I also love how thoughtful your reviews are. I keep following a blog if they update it regularly and have information that I care about. Happy Birthday and Blogoversary! Five years is fantastic. One of the things that keeps me reading/following a blog is communication/conversation. I love when they also visit my blog when they can or they show interest in what I’m doing. It makes it feel less one-sided and I like getting to know people! 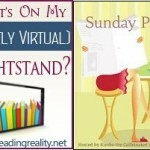 Pingback: The Sunday Post AKA What’s on my (Mostly Virtual) Nightstand 4-10-16 – Escape Reality, Read Fiction! Honest reviews make me visit a blog often! I love reading opinions for books that are on my tbr list or for those that I’ve read. Blogs that follow me back and go comment back and forth with me on my blog are the ones I tend to follow regularly. Happy blogoversary and birthday! Pingback: The Sunday Post AKA What’s on my (Mostly Virtual) Nightstand 4-17-16 – Escape Reality, Read Fiction!